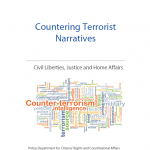 This study, commissioned by the European Parliament’s Policy Department for Citizens’ Rights and Constitutional Affairs at the request of the LIBE Committee, provides an overview of current approaches to countering terrorist narratives. 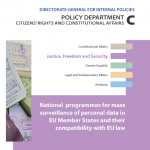 The first and second sections outline the different responses developed at the global and European Union levels. The third section presents an analysis of four different approaches to responding to terrorist narratives: disruption of propaganda distribution, redirect method, campaign and message design, and government communications and synchronisation of message and action. The final section offers a number of policy recommendations, highlighting five interrelated ‘lines of effort’ essential to maximising the efficiency and effectiveness of counterterrorism and countering violent extremism strategic communication. 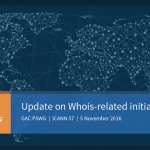 A November 2016 slide deck from the Governmental Advisory Committee Public Safety Working Group of ICANN related to initiatives to improve the accuracy of data in the WHOIS system of domain and IP address ownership/registration. 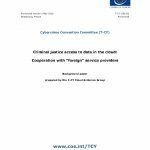 The purpose of the present background paper is to provide a snapshot of policies and practices of some major US service providers regarding their “voluntary” disclosure of information to law enforcement authorities in foreign jurisdictions, and thus to facilitate discussion of future options regarding criminal justice access to electronic evidence in the cloud. The prevention, investigation and prosecution of cybercrime calls for a close cooperation between partners from various sectors. The European Cybercrime Centre (EC3) at Europol has gained practical experience in such forms of multi-disciplinary cooperation and aims to share some of this experience through this note as input for discussions at the Conference on Jurisdictions in Cyberspace on 7-8 March 2016, organised by the Dutch Presidency of the Council of European Union. 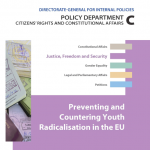 Upon request by the LIBE Committee, this study focuses on the question of how to best prevent youth radicalisation in the EU. It evaluates counter-radicalisation policies, both in terms of their efficiency and their broader social and political impact. Building on a conception of radicalisation as a process of escalation, it highlights the need to take into account the relation between individuals, groups and state responses. In this light, it forefronts some of the shortcomings of current policies, such as the difficulties of reporting individuals on the grounds of uncertain assessments of danger and the problem of attributing political grievances to ethnic and religious specificities. Finally, the study highlights the ambiguous nature of pro-active administrative practices and exceptional counter-terrorism legislation and their potentially damaging effects in terms of fundamental rights. 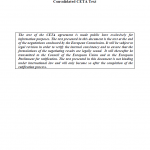 The text of the CETA agreement is made public here exclusively for information purposes. 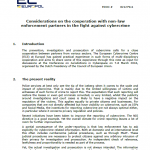 The text presented in this document is the text at the end of the negotiations conducted by the European Commission. It will be subject to legal revision in order to verify the internal consistency and to ensure that the formulations of the negotiating results are legally sound. It will thereafter be transmitted to the Council of the European Union and to the European Parliament for ratification. The text presented in this document is not binding under international law and will only become so after the completion of the ratification process. The shadow banking system can broadly be described as credit intermediation involving entities and activities outside the regular banking system. Intermediating credit through non-bank channels can have important advantages and contributes to the financing of the real economy, but such channels can also become a source of systemic risk, especially when they are structured to perform bank-like functions (e.g. maturity transformation and leverage) and when their interconnectedness with the regular banking system is strong. Therefore, appropriate monitoring of shadow banking helps to mitigate the build-up of such systemic risks. The FSB set out its approach for monitoring the global shadow banking system in its report to the G20 in October 2011. This report presents the results of the third annual monitoring exercise following this approach, using end-2012 data. The report includes data from 25 jurisdictions and the euro area as a whole, bringing the coverage of the monitoring exercise to about 80% of global GDP and 90% of global financial system assets. 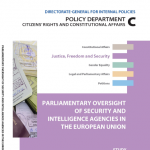 This study evaluates the oversight of national security and intelligence agencies by parliaments and specialised non-parliamentary oversight bodies, with a view to identifying good practices that can inform the European Parliament’s approach to strengthening the oversight of Europol, Eurojust, Frontex and, to a lesser extent, Sitcen. 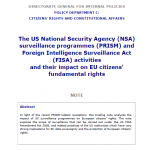 The study puts forward a series of detailed recommendations (including in the field of access to classified information) that are formulated on the basis of in-depth assessments of: (1) the current functions and powers of these four bodies; (2) existing arrangements for the oversight of these bodies by the European Parliament, the Joint Supervisory Bodies and national parliaments; and (3) the legal and institutional frameworks for parliamentary and specialised oversight of security and intelligence agencies in EU Member States and other major democracies. 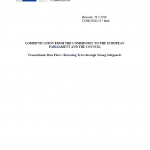 A draft version of the EU Heads of Mission report on Jerusalem for 2012 was authored in January 2013 and reportedly leaked to a number of major news outlets by the organization Breaking the Silence. 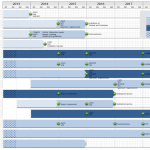 This document contains detailed recommendations on how to implement the best practices identified in the Clean IT project. It will be developed further in the months ahead. After the end of the Clean IT project it will only be shared with organizations that have committed to implementing the best practices. It will be developed further with these organizations participating in the Clean IT permanent public-private dialogue platform. Shadow banking, as one of the main sources of financial stability concerns, is the subject of much international debate. In broad terms, shadow banking refers to activities related to credit intermediation and liquidity and maturity transformation that take place outside the regulated banking system. This paper presents a first investigation of the size and the structure of shadow banking within the euro area, using the statistical data sources available to the ECB/Eurosystem. The FSB has roughly estimated the size of the global shadow banking system at around € 46 trillion in 2010, having grown from € 21 trillion in 2002. This represents 25-30% of the total financial system and half the size of bank assets. In the United States, this proportion is even more significant, with an estimated figure of between 35% and 40%. However, according to the FSB estimates, the share of the assets of financial intermediaries other than banks located in Europe as a percentage of the global size of shadow banking system has strongly increased from 2005 to 2010, while the share of US located assets has decreased. On a global scale, the share of those assets held by European jurisdictions has increased from 10 to 13% for UK intermediaries, from 6 to 8% for NL intermediaries, from 4% to 5% for DE intermediaries and from 2% to 3% for ES intermediaries. FR and IT intermediaries maintained their previous shares in the global shadow banks assets of 6% and 2% respectively. This study grew out of the 1997 STOA report, ‘An Appraisal of the Technologies of Political Control’ and takes that work further. Its focus is two fold:(i) to examine the bio-medical effects and the social & political impacts of currently available crowd control weapons in Europe; (ii) to analyse world wide trends and developments including the implications for Europe of a second generation of so called “non-lethal” weapons. Three confidential draft copies of the European Financial Stability Facility’s guidelines on primary market purchases, secondary market interventions and precautionary programs dated October 19, 2011. Since the fourth review, the situation in Greece has taken a turn for the worse, with the economy increasingly adjusting through recession and related wage-price channels, rather than through structural reform driven increases in productivity. The authorities have also struggled to meet their policy commitments against these headwinds. For the purpose of the debt sustainability assessment, a revised baseline has been specified, which takes into account the implications of these developments for future growth and for likely policy outcomes. It has been extended through 2030 to fully capture long term growth dynamics, and possible financing implications. WikiLeaks Financial Blockade Complaint Against Visa and MasterCard concerning infringements of Articles 101 and 102 of the EU Treaty. U.S. Confidential Anti-Counterfeiting Trade Agreement (ACTA) August 25, 2010 Draft. EU Restricted, U.S. Confidential Anti-Counterfeiting Trade Agreement (ACTA) July 2010 Draft. A. whereas the existence of a global system for intercepting communications, operating by means of cooperation proportionate to their capabilities among the USA, the UK, Canada, Australia and New Zealand under the UKUSA Agreement, is no longer in doubt; whereas it seems likely, in view of the evidence and the consistent pattern of statements from a very wide range of individuals and organisations, including American sources, that its name is in fact ECHELON, although this is a relatively minor detail . . . 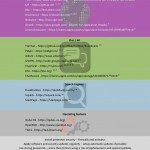 Restricted US-EU ACTA Copyright Treaty Civil Enforcement and Special Requirements Position Paper, February 12, 2010.